Oh, boy! I’m going to be singing this song all day now LOL!!! It’s the first thing that popped into my head when naming this so I went with it. The cardbase is Stampin’ Up! in River Rock. One of my favorite neutrals to work with. 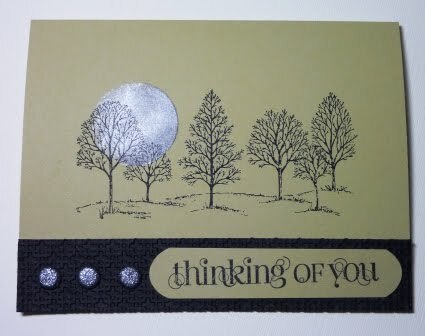 And, I’ve used a classic stamp set from SU – Lovely As A Tree. The moon has been made with the reverse masking technique. I Simply punched out a circle in a piece of scrap cardstock. Then sponged it first with Encore Silver and then a little bit of Basic Black. Next, the trees image was stamped over top of the moon. I dry embossed a piece of Basic Black cardstock with the Square Lattice folder, then used my Crop-A-Dile to punch three holes for the brads. The sentiment has been stamped in Basic Black on a rectangle of River Rock and then I rounded the edges with a 3/4″ x 15/16″ oval punch. Who’ll catch you singing Bad Moon Rising today? LOL!